A wedding day is such an important and special time. As your marriage celebrant, I will listen carefully as to how you both would like your wedding ceremony to unfold. 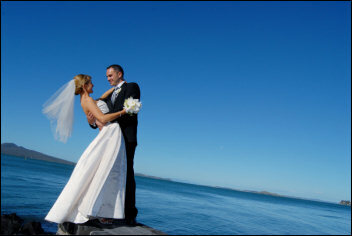 Together we will craft your ceremony, and incorporate your wishes, reflecting your personalities, backgrounds and values. Most couples are not too sure about what ceremonial options are available when getting married. I am happy to offer you ideas, recommendations and resources. The following is a brief summary of the service I provide for a wedding ceremony. This is a free 'get-to-know each other' meeting. I will get a general overview and discuss creative design of the ceremony with you. I can help you with ideas of what you may (or may not) want to include in your wedding ceremony. This is the real 'in-depth' meeting and the major preparation stage for your wedding ceremony. We will share ideas, reflections and plan all stages of the ceremony, with specific details of each stage. I will attend the rehearsal if required to do so, but there will be an additional cost of $50 to cover travelling expenses etc. I will arrive at least 30 minutes before the wedding time. I will deliver your ceremony with warmth, care and professionalism.